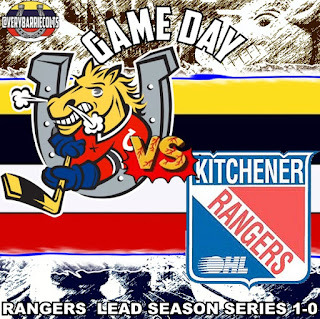 Game Preview: Barrie Colts vs Kitchener Rangers. #OHL - Very Barrie Colts | A website covering the Barrie Colts of the OHL. Tonight the Barrie Colts will be in Kitchener to face the Kitchener Rangers who currently sit in 2nd place in the OHL. This is the second of two meetings this season between the Colts and the Rangers. Kitchener took the first game over the Colts in Barrie on October, 17th in a 3-1 win. Overall the match up was pretty tight and both teams were still finding their groove. With the Colts on a win streak and the Rangers hoping to get back in the win column, it should be a pretty good match-up to watch. The Rangers are coming off of a tough loss at the hands of the Erie Otters last night. In a battle for the top spot in the OHL, it was Erie who would leave with the 3-2 victory. Erie may not have dominated on the score sheet but they clearly were the stronger team generating 39 shots on goal compared to Kitchener only getting 22 on net. It was clear that puck possession was the main factor for the dominance in scoring chances, and if Erie beat you in the faceoff circle 43 times out of 61 chances you are asking for them to lay a beat down on you. Considering these chances, Kitchener managed to keep this a tight game and had VERY strong goaltending. Kitchener still heads into tonight with a strong 7-3-0-0 record in the past 10 games. Barrie heads into tonight hoping to extend their win streak to 5 games over a very strong team. The Colts are coming off of a 4-1 win last night over the Owen Sound Attack. Though, the Colts lacked discipline which fond them getting out shot 35-28 while serving 7 minor penalties, the Colts managed to kill them all off and improve their record to 8-2-0-0 in the last 10 games. Mac Blackwood was strong for the Colts stopping 34 of 35 shots faced while Nattinen, Labanc, Scott and Lemieux all registered a goal each. Overall a solid night for the Colts, however there is a chance that some are still serving penalties from the game.. Colts need to work on their 'chill'. Keys to Success: You want to say "stay out of the box" but nobody seems to be able to make the Colts pay while short handed. Sure, their PP may not be that much to boast about, the Colts continue to roll on the penalty kill. Almost like they have gotten a lot of practice over the last couple seasons. If the Colts can find a way to just play how they have been and find a way to improve their own power play, the Colts can become a really strong team. Overall, they are playing with a lot of energy. Though they have been solid on the PK, you don't want to see top guys taking multiple penalties a game. Soon, it will come back to bite the team. Players to Watch: Brendan Lemieux has 9 points in the last 5 games while Kevin Labanc has 23 points in the last 10 games. Look for these guys to continue these point streaks. We would also say watch Blackwood but I think at this point we always expect him to be incredible. Puck drop is scheduled for 7:30.